I don’t like the tribal nature of American politics, in part because I get criticized for not playing the game. The pro-Trump crowd goes after me when I condemn the President’s protectionism and wasteful spending. And the anti-Trump crowd goes after me when I applaud the President’s tax cut and regulatory reform. I tell both groups that I care about public policy rather than personal or partisan loyalty. Not that this explanation makes either group happy. Today, I’m going to give a “thumbs up” to the President for what he’s doing about car mileage regulations. Which means the first group will be happy and the second group will be irritated. To be more specific, the Trump Administration is proposing to ease up on the CAFE (corporate average fuel economy) rules. The Obama Administration, working with California environmentalists, proposed to make these regulations far more costly. Trump’s people basically want to freeze the car mileage mandate at the current 37-miles-per-gallon level. 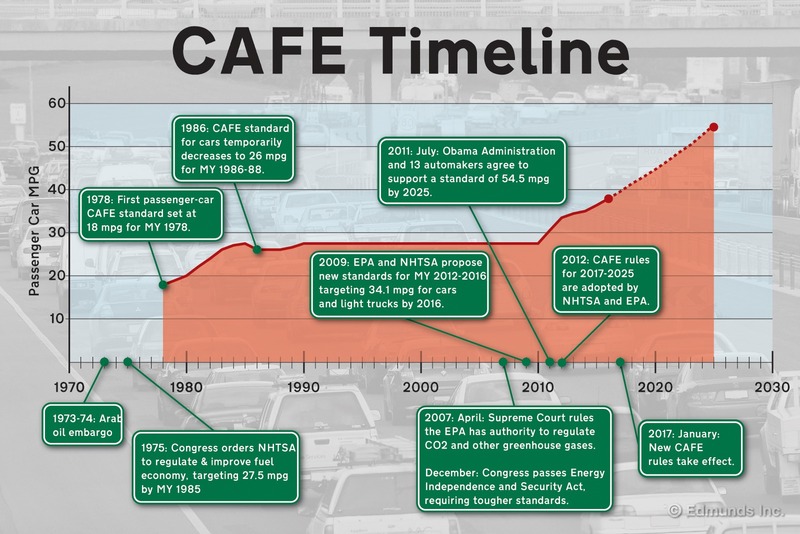 Here’s a look at the history of the CAFE standards. Sam Kazman of the Competitive Enterprise Institute explained earlier this year why these regulation impose high costs. And deadly costs. The Trump Administration apparently was listening to Sam, and has decided to block future increases in the CAFE mandate. Environmentalists are predictably upset, but the Wall Street Journal opined on this topic a couple of days ago and explained why it is good news. The Trump Administration’s deregulation is improving consumer choice and reducing costs… Its proposed revisions Thursday to fuel economy rules continue this trend to the benefit of car buyers… Obama bureaucrats were acutely blind—perhaps willfully so—to economic and technological trends in 2012 when they set a fleetwide average benchmark of 54.5 miles a gallon by 2025. …Americans prefer bigger cars, which makes it harder for automakers to meet the escalating Cafe targets. …As prices rise to meet the new standards, consumers would also wait longer to replace their cars. The average age of a car is approaching 12 years, up from about 8.5 in 1995. Newer cars are more efficient and safer, so longer vehicle turnover could result in more traffic fatalities… Thursday’s Trump Administration proposal to freeze—not roll back—fuel economy standards at the current 2020 target of 37 miles a gallon. …Automakers also want to duck a prolonged legal tussle with California, which received a waiver from the Obama Administration under the Clean Air Act in 2013 to establish its own emissions standards and electric-car mandate. The proposed Trump standards would apply nationally. Holman Jenkins of the WSJ also weighed in on the issue, pointing out that undoing Obama’s expansion of CAFE mandates will have no impact on the earth’s climate. …the effect on climate change would be zero. The Obama White House at the time exaggerated by a factor of two the Environmental Protection Agency’s estimate of the effect on total emissions over the lifetime of the cars involved. It doesn’t matter. Two times nothing is still nothing. …Let’s remember the truth of Mr. Obama’s fuel-economy rules. He did not wander the balconies of the White House gazing far into the future when he drafted the 2021-25 fuel economy target of 54.5 miles a gallon. His flunkies, as documented in a House investigation, simply were looking for a impressive-sounding number to serve the administration’s political interests at the time. …in undoing Mr. Obama’s policies, Mr. Trump is doing nothing to hurt the climate. Myron Ebell of the Competitive Enterprise Institute also wrote on the topic and noted that Trump’s policy will save about 1,000 lives each year. …the administration has struck a blow for consumer choice that will be good news for drivers planning or hoping to buy a new car in the next decade. That’s because the mileage mandate is one of the main causes of rapidly rising vehicle prices. …Meeting ever more stringent fuel economy standards is driving up new vehicle prices. Sticker shock is thereby causing a lot of people to hang on to their current cars. The average age of all cars on the road is now at an all-time high of over 11-1/2 years. …Freezing CAFE standards will make new cars more affordable for millions of Americans and also allow many of them to buy bigger and hence even safer new models. How much safer will be hotly debated. The Transportation Department concludes that the proposed changes will prevent about 1,000 traffic fatalities a year. …For many people, fuel economy will still be the most important factor in choosing a new car. The good news for them is that the Trump administration’s action will in no way prevent them from buying a model that gets great gas mileage. The good news for everyone else is that the choice of models will be much wider than if the CAFE standard remained 54.5 mpg. By the way, this isn’t simply a matter of saving lives. After all, we theoretically could save thousands of lives by simply banning automobiles. In the world of sensible public policy, we make trade-offs, deciding if achieving a certain goal is worthwhile when looking at all the costs and all the benefits. So it’s theoretically possible that a policy that leads to more premature deaths might be acceptable. But CAFE fails even on that basis. As Marlo Lewis explained a few years ago, the policy both kills people and imposes net financial costs. The bottom line is that Donald Trump just improved his grade on regulation. Back in April, I gave him a B+ on regulation. But then he did something foolish in June that (if I recalculated) would have dropped him to a B. Now he’s probably back at a B+ because of the change to the CAFE rules. Given what he’s doing on trade, he needs to boost his other grades as much as possible!